Old photographs are great. They provide a grasp on history that fosters the telling and retelling of stories that should never die. We found this great piece of history on Tumblr, but it's from Dave at Shorpy. 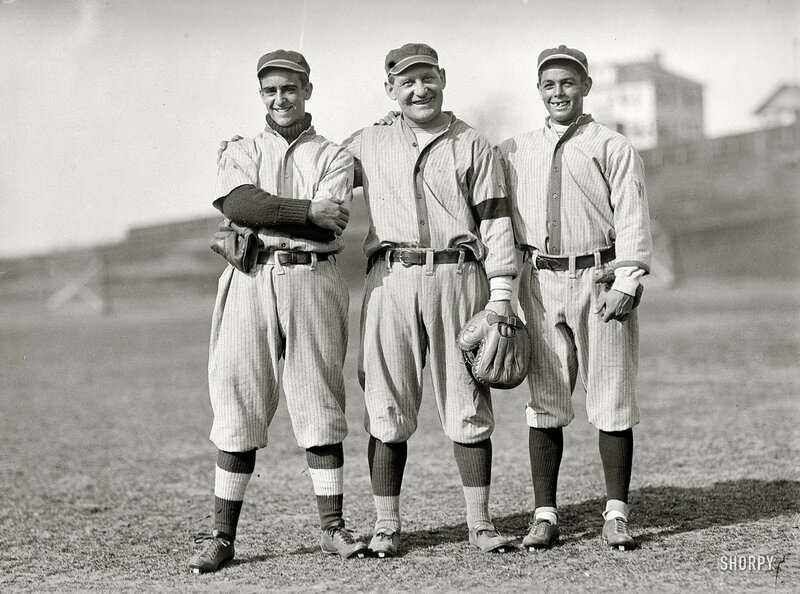 It is a 1913 photograph of three Washington Senators teammates, Germany Shaeffer flanked by a couple of young Cuban ballplayers, Jacinto Calvo and Merito Acosta. A true vaudevillian showman. Sarcastic, witty, and a solid ballplayer. He stole first base (from second). Pulled off the hidden ball trick in the World Series. Got kicked out of a game for wearing a fake mustache to bat. What more do you need to know? Cuban players Jacinto Calvo, left, and Merito Acosta, right, with Washington Senators teammate Germany Schaefer in this circa 1913 photo found on Shorpy.com. Calvo and Acosta were among the first Cubans to play in the major leagues in the modern era. Acosta played for the Senators from 1913-16 and split the 1918 season with Washington and the Philadelphia Athletics. Calvo played in 1913 and 1920 with Washington. Acosta, who was elected to the Cuban Baseball Hall of Fame in 1955, played for Habana, Red Sox, Almendares and Marianao during 12 Cuban League seasons between 1913-25. He also led Marianao to the Cuban League pennant as manager in 1922-23, according to Who’s Who in Cuban Baseball, 1878-1961. Calvo was elected to the Cuban Baseball Hall of Fame in 1948 after 14 winters in Cuba with Almendares, Habana, Orientals and Marianao from 1913-27.